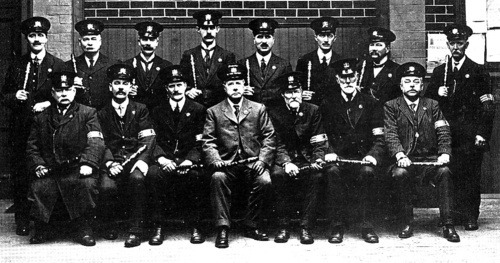 The Leith Special Constabulary of 1916 look like they could dismiss us without too much bother. Tom Archibald’s book on the History of the Lothian and Borders Police doesn’t mention if this particular photograph was ever seen outside the police station – it merely states that it’s an unusual picture. Other group portraits exist which show police in front of a wall sporting earlier (of course, pace Mitch Hedberg) group portraits. I suppose it possible that such photos are taken in places with public displays of police group portraits, but it doesn’t seem very likely.